There is a deep portion of the brain, the amygdala, which triggers BOTH negative & positive emotions. So when we see a frightening image surrounded by beautiful bright complimentary color, the brain is perturbed. We hate it but we love it! What’s a brain to do?! Paul Gauguin and Egon Schiele perhaps unconsciously combined the beautiful with the sinister. 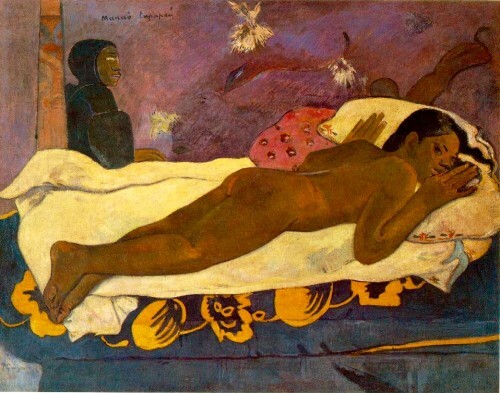 Gauguin was a brilliant artist who is called The Father of Modern Art. He was also a pretty nefarious character deserting his wife and children so he could live in “ecstasy, calmness and art” on the island of Tahiti. In the above painting, notice the sinister figure in the background. Kinda scary, huh? But, oh, what gorgeous color! A melancholy eccentric, Egon Schiele (Austrian), often drew his models from the top of a ladder looking down capturing unusual, arresting compositions. 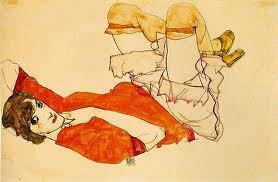 Look at the contorted, twisted figure in Egon Schiele’s drawing. The expression on the face is…confused? Angry? Sad? Yet the figure has a certain innocence and the combinations of color are thrilling! These images of dark and light, negative and positive are indeed disturbing. But we are drawn to them. Could the artists be showing us life in all its mystery? Your latest blog of dark and then bright colors is wonderful! I am going back, however, to the “Eat At Art” blog to tell you how very fabulous the video was/is! Oh wow, Kirby, you really push beyond, expand your purview, and find even more fascinating truths. Didn’t know about the role of the amygdala… being in the deep brain, could that explain why those who suffer dementia still respond to art and music when all other awareness is lost? More, more from the Blog! does emphatically demonstrate to us that we are indeed complex organisms, capable of conjoining our positive and negative emotions, and sacrificing them on Gauguin’s specious Tahitian altar of art, in a vain quest for “ecstasy and calmness”. Color-full and scary. I really enjoy your blogs. They are always informative and inspiring! My brain ain’t perturbed as Waylon Jennings sing’s “I’ve always been crazy with one foot on the line and it’s keep me from going insane” now there is fine art! Yes. I think you are onto it…light and dark…good and bad….right and wrong…..integration….balance. Integration leading to balance seems to be almost beyond humans’ skill set most of the time, or for sure a lot of the time. Wish it were otherwise. But these artists have pointed the way. Thanks Kirby! Interesting, as always, Kirby. Keep it coming! I think what the scientists think. The dichotomy of dark and evil in the paintings is as agitating as the beautiful and ugly, peaceful and horror, etc. in real life. These dichotomies are hard to understand, leaving us always perplexed as to why. One aspect is probably the element of mystery which we feel compelled to clarify. The shadowy, or undetailed, is the unknown we fear, but sense that we can confront and unmask. Art can call the viewer to investigate further, to seek revelation. There is always more; more to see; more to realize . . .
I’m drawn to art that disturbs the silent, hidden or forgotten part of me that resides deep in psyche. And yes, it is a relief to see it (shadow being whether depicted as a dark figure or beguiling expression) outside of its internal room. I can stare at, acknowledge it, have a conversation about it or to it. What’s better yet, the knowledge that I am not the only one. If a connection is made, however emotionally felt, a shared intimate experience happens. I hope to at least present that opportunity to some with my own art. Art and the human mind is a fascinating thing–like why do people slow down,rubber-neck, and gawk at car accidents? In hopes of seeing some awful vision that could haunt them forever?? That being said I am a designer and the most difficult challenge I have with clients is reading what kind of art appeals to them. That is a whole other realm that is so related to what moves them and the mystery of that emotional draw. I’m not totally clear why I respond to one piece of art and not another–but as we all know there is a definite “pull” that only you can feel…. You take us to a place where art and life live together. The haunting images that you’ve chosen move us from our feeling of being safe to a place of vulnerability. Thanks for your stimulating and beautiful blogs. I enjoy impressionistic art. Why? A variety of reasons that have been well chronicled by others over the years. This group of artists, like their work, are for the most part a bit personally unique. No surprise as we study and view their products. Paul Gauguin may take the prize for an uncommon life and life style. But, that is not what he is about. His art is interesting. His art is varied. He is not a model of humanity to emulate. I am O.K. with view. Viva to those who separate themselves from others.